Construction and Water Department, Iiyama City, Nagano Pref. Located at the northern end of Nagano Pref. and adjoining to Niigata Pref., Iiyama City is well known as one of the deepest-snow districts in our country. 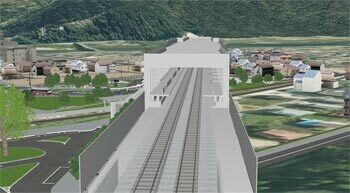 Here, one of the hottest topics now is opening of Iiyama station of Hokuriku Shinkansen planned in the end of 2014. This issue picks up Iiyama City, Nagano. Especially we focus on "Shinkansen Station Area Development Section", which takes responsibility of business related to the construction project of Hokuriku Shinkansen; and "Town Planning Section", which promotes urban planning and town development. Reflecting the current mayor's policy who is familiar with information and communication technology (ICT), the city has been adopting advanced technologies and systems actively. As part of this, the city has been paying attention to the possibility of three-dimensional real-time VR software "UC-win/Road" of FORUM8. After introducing it, the city has been promoting its effective use in various projects and work processes. Ahead of an interview in the government facilities, in spite of rain, the staff members in each section kindly guided us around the sites of town planning points such as a hill looking down on the new station under construction, the rotary construction planned site in front of the station, and Iiyama Ruin of Castle Park. When standing on the hill with Joetsu area on the back where the Nagamine tunnel runs through under my feet, I could overlook a great panorama starting with a railway that extends straight towards the station building under our eyes. It passes over the Chikuma River at the Nanohana Ohashi Bridge, drawing a loose curve, being absorbed into the Koshasan Tunnel in the direction of Tokyo. I caught a glimpse of an emerging figure of Iiyama that fused nature and urban functions, which will be realized in several years. Development Section, Construction and Water Department, Iiyama City, Nagano Pref. "Hokuriku Shinkansen is planning to open the new route between Nagano and Kanazawa at the end of 2014. Iiyama Station will be established next to Nagano St. With this (arrival of) new age, we are coping to innovate the town planning and its method. Iiyama City has a population of about 24,000. It is ranked as the city with the smallest population in the prefecture. In addition, in recent years depopulation and aging are progressing, to which solution has been required. On the other hand, the city is blessed with superior sightseeing resources, such as recreation environment of all four seasons with rich natural surroundings including Madarao Highlands and a Nabekura Highlands, Togari hot spring, many Shinto shrines and Buddhist temples that maintain the traces of the earlier time including the Iiyama Ruin of Castle, folk craft including Iiyama Buddhist altars and Uchiyama paper, and Takahashi Mayumi doll museum that opened in 2010. Under these circumstances, Mr. Takashi Matsuzawa, Chief of Town Planning Section / Shinkansen Station Area Development Section of Construction and Water Department of the city expects that development of the Hokuriku Shinkansen, which links Nagano and Kanazawa via Iiyama and plans to further link between Tokyo and Osaka, will be a substantial element for the future development of Iiyama city. Construction and Water Department of the Iiyama city comprises five sections of Highway and River, Town Planning, Shinkansen Station Area Development, Water and Sewage, and Why Not Live in Iiyama. Among these, main services of Shinkansen Station Area Development Section include opening of the Iiyama Station of Hokuriku Shinkansen and construction work related to development of surrounding urban facilities (whole development area of 20ha) and land readjustment (target area of 7.7ha) in accordance with the transfer and consolidation of the existing Iiyama station of the old railway line 300m away from there. On the other hand, Town Planning Section consists of Planning Unit in charge of urban planning etc. and Town Development Unit in charge of development and management of towns and parks with an emphasis on landscape. 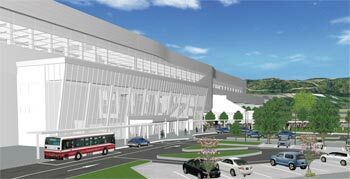 Planning Unit performs design work of the new station building and urban facilities as well as public relations activities about them, while coordinating with Japan Railway Construction, Transport and Technology Agency (JRTT), which is the main body of providing the Hokuriku Shinkansen. 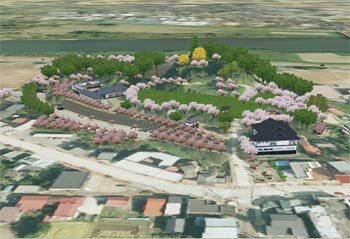 Town Development Unit promotes rebuilding of the civic center, maintenance of the Iiyama Ruin of Castle Park, and town planning of the urban center in order to improve tourism in the urban district before the opening of Shinkansen. It is one of the city's features to have gradually created environment of accepting ICT from early on. In addition, it also strengthened the city's unique cultural feature that present Mayer Mr. Masanori Adachi has profound knowledge in ICT since he was the first general manager of information policy office when he was a staff member of the city, for example. Specifically, as personal computers (PC) were provided for the staff on a one-for-one-person basis in order to prepare the network foundation in 1999, intra-office groupware was introduced. Next, GIS (geographical information system) was adopted ahead of neighboring regions. In addition, receiving subsidy of Ministry of Education, Culture, Sports, Science and Technology in 2009, the city started the school ICT environmental improvement project for all schools in the city. PCs were provided to teachers on one-to-one basis, linking schools with a network. They are working on effective utilization of the teaching materials put in the server to strengthen information education of children. The start of introducing UC-win/Road by the city originates in 2009, when present Mayor, who was Deputy Mayor at that time, happened to see its demonstration at the exposition that FORUM8 took part in. Before that, Mr. Tsuyoshi Watanabe, chief examiner of Town Development Unit, Town Planning Section took charge of design of the vicinity of Iiyama Station of the Hokuriku Shinkansen and examination of various town planning associated with it around 2003. While models had been used in the process, seeing an advanced example of VR (virtual reality) created by another company, staff members in charge once strongly felt like using three-dimensional VR. However, since it was necessary for VR they examined to have the vender to create everything from the beginning to the end, its operational form to modify again and again in the design process as well as its cost obstructed them to introduce it. In contrast, the most important reason that UC-win/Road attracted attention was its comparatively low cost to introduce. In addition, its good cost performance was also evaluated. For example, the model is preset to some extent so that the staff member can create or modify VR easily. In Summer 2009, more than ten staff members in the fields of construction, technologies, and information took part in the presentation made by the FORUM8 staff at the City Hall. Looking at the models that represented the future image of other station, they were convinced of possibility of effective use of UC-win/Road. In November in the same year, Mr. Tsuyoshi Watanabe and Mr. Masaki Horikawa, Chief Examiner of Shinkansen Station Area Development Section joined a training course that ran two days with an overnight stay held by FORUM8. They decided to purchase UC-win/Road at the end of November. After introducing UC-win/Road, the first thing they did with it was to create a tool for studying construction sites for a new school building construction project associated with reorganization of high schools in the city. 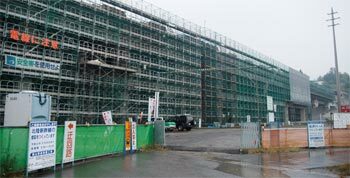 At first, a place close to the Iiyama Ruin of Castle Park was considered as a construction site. Then VR was used to simulate how the new school building would be located in relation with the castle, a historic symbol, and what the completed image would be like so that the parties concerned could share information. In the end, the greatest importance was placed on protecting cultural properties of the Iiyama Ruin of Castle and preserving attraction of the surrounding area in a good condition. Thus, the school building site was moved to another location. At that time, based on the technique Mr. Tsuyoshi Watanabe, who then belonged to the Board of Education, learned in the training course and with advice from FORUM8, they completed VR in about one month. They realized the result that contributed to examination of such as appearance and volume of the building. In 2010 fiscal year, use of UC-win/Road developed into a project on the opening of the Iiyama Station of Hokuriku Shinkansen. Towards the decision process of the station design, Mr. Masaki Horikawa and Mr. Hideshi Maruyama, Chief Examiner of Planning Unit, Town Planning Section started modeling roads and houses within the land readjustment area, arrangement of which had already been decided. The length of the Hokuriku Shinkansen rail line (between Nagano and Kanazawa) is approximately 228km. 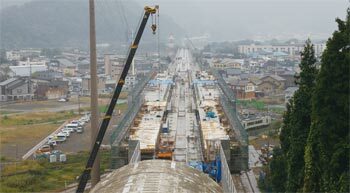 The modification of the construction work plan between Nagano and Joetsu was authorized in March 1998, and construction work of Iiyama Tunnel started in August of the year. The construction of 5th Chikumagawa Bridge (Nanohana Ohashi) started in 2002 fiscal year, and that of Iiyama Station Overpass in 2002. "The ground around the station had not been developed very much yet in those days (2010 fiscal year), so we thought that it would be the most effective to show various patterns of what the station and a station square would be like in trial images. Therefore, the city side prepared for basic data about roads, squares, and the Shinkansen in the land readjustment area (7.7ha). Based on them, FORUM8 spent about half a year in creating models that would serve as the base for examining design in the office, as Mr. Hideshi Maruyama recalls. In the next year 2011, after the designs of station etc. were almost determined, the area to reflect in the models was expanded to the whole development area (20ha). This work started in March. 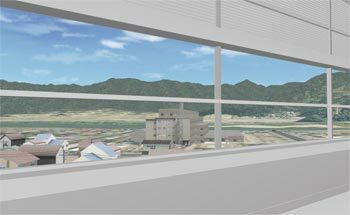 3D simulation was created with which citizens could experience the station building and urban facilities along the plan at that time simulatively. 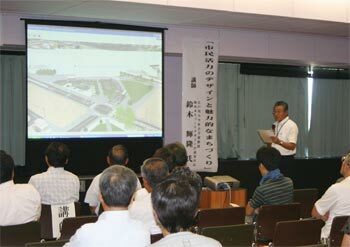 The result was opened to the public at "Iiyama Town Planning Forum 2011" held in July 9. Then in the end of July, it was also uploaded on the Website of the city. In the future, in addition to reflecting the change in design, they plan to do modeling in the form closer to the reality by elaborating the model including the exterior. They expect to open it to the public as early as within this year. All of Mr. Takashi Matsuzawa and others evaluate that UC-win/Road will serve as a very effective tool that substitute for the conventional model in not only sharing information among the parties within the city office but also having design intention understood by the public who are not familiar with drawings. 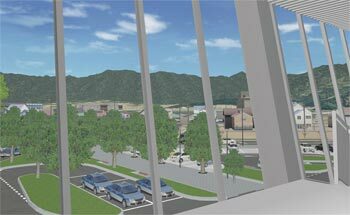 Mr. Hideshi Maruyama, in particular, states its advantage of allowing the user to experience bodily sensation of the view from the station platform after completion from the design phase. The construction work related to the new station will be completed in 2013. After that, test operation of the Shinkansen (between Nagano and Kanazawa) will be conducted for 1 season. Plazas at the East, West, and South exits and urban facilities such as one- or multi-storey parking lots are planed to complete by 2014 fiscal year respectively. While keeping the continuity with them, land readjustment will be progressed. The existing Iiyama station of JR Iiyama Line will finish its duty as soon as its function is transferred in the new station. On the other hand, in connection with the opening of this Hokuriku Shinkansen / Iiyama Station, various approach is in progress from the aspect of town planning. 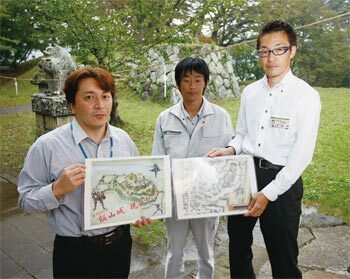 Tsuyoshi Watanabe mentions examples such as a town planning project with excursion characteristics aiming to develop the streets by modifying landscape of existing individual buildings and planting, a construction project of a complex facility with multiple functions by rebuilding the civic center, and maintenance project of the Iiyama Ruin of Castle Park. For all of them, harmony of landscape and consensus building with local residents were key elements. So they expect simulation with UC-win/Road and its effective use in the presentation. 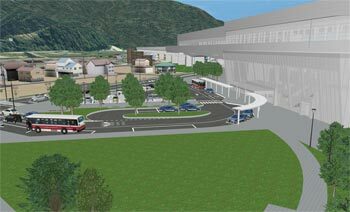 "I think that it is an effective measure not only for a big project such as this one (opening of the Iiyama Station of the Hokuriku Shinkansen) but also for a landscape study in the urban planning in progress now". 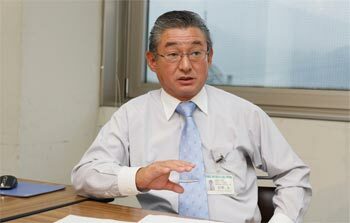 Mr. Takashi Matsuzawa mentions diverse possibility of UC-win/Road that he realized through a series of its use, saying that he wants to investigate practical use in new fields such as more advanced studies in relation with town planning including search of evacuation routes, as well as welfare and education. show the castle or simulation of thinning the existing trees.